Well, I wasn't going to do any reviews until later this year, but several of a recent flurry of releases caught my attention and my interest and I made some time for checking them out. One of them is Calculate Linux. Others have reviewed it before and found themselves inundated with offers of Russian brides and other more vile advertisements, but I won't let that put me off because, as I can reveal, I like the product itself very much. So with comment permissions tightened and my email address replaced I embark on this mission. 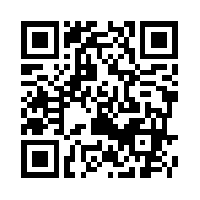 If you really want to get hold of me you can do so on Google+ or Twitter. In case you haven't guessed yet the project is headquartered in Russia, and from looking at their forum and social traffic seems to have a lot of users in the former Eastern Bloc. Calculate comes in many versions and spins, including Calculate Linux Directory Server for the enterprise and Calculate Linux Media Center. 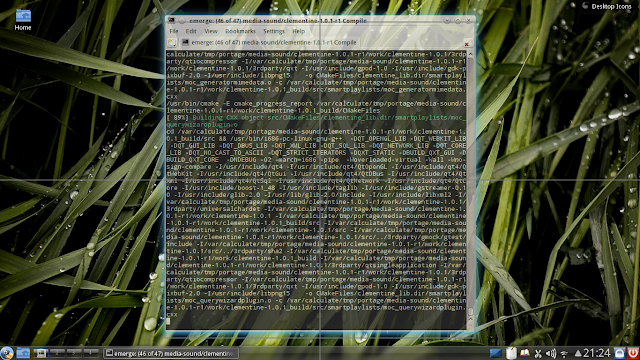 I'll be trying the KDE edition of Calculate Linux Desktop 12.0, short CLD 12, which is now the default desktop. 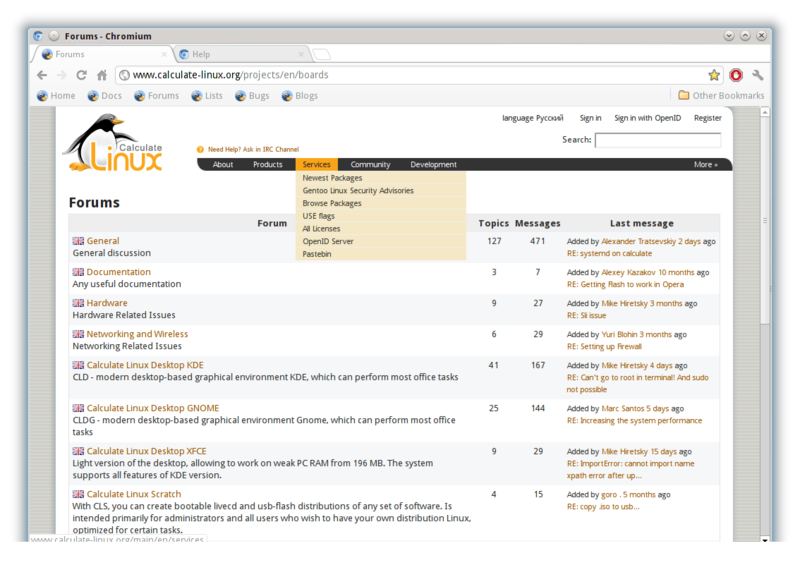 GNOME 2 (CLDG) and XFCE (CLDX) editions are also available, and all come with client side directory server integration for a full solution for business. According to the statement on their page it is intended to be easy linux from the source, and we'll see if that holds true. 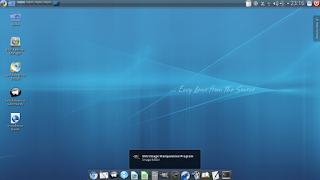 According to the features page you get roaming profiles with CDS, common desktop applications and basic settings and a unified look and feel across all desktop environments, support for a wide variety of major languages, and 100% compatibility with Gentoo repositories, both from source and with support for binary updates, with Portage. CLD can be installed on a USB Flash drive or USB-HDD and supports all the ext file systems, reiserfs, jfs, xfs, btrfs and fat32 for your shares out of the box. Sounds quite promising so let's dive in. The download is a beefy 2,235MB for the i686 edition with KDE and 2,400MB for 64-bit. Torrents are available on the download page, and under stages one can download weekly updated images with the latest changes incorporated. The chunky size includes all the necessary development libraries and compilers you need with distributions like Gentoo and Slackware. Once the image was burned to CD booting into the live session went without any problems, remarkably smooth and quite fast in comparison for this big desktop environment. CLD seems to like my Acer, actually most distributions do provided they got the required firmware on board from the start. This is an Aspire 5551, with AMD Radeon HD 4250 integrated graphics (running nicely with the free driver), 4GB of Ram and Broadcom network for both wifi and ethernet. I chose i686 for better compatibility with gaming and Wine. CLD employs a classic desktop layout more reminiscent of the old KDE 3, using Folder View to provide icons on the desktop and a classic menu style for KDE. All the links are geared towards making it easy for the prospective user to install CLD to hard drive. You get the KDE Partition Manager, a link to start the install program and also the install guide right in front of you. I rarely use Skype so no hard feelings, but it tainted that good first impressions a little. There are people who rely on Skype quite a bit and this sure is loosing them a whole bunch of users in one swoop. British-English keyboard layout and localization are also not available, only American-English. Users of other languages will appreciate that the distribution comes with German, Russian, Spanish, Portuguese, Italian, French, Bulgarian, Polish, Ukrainian and Romanian localization. 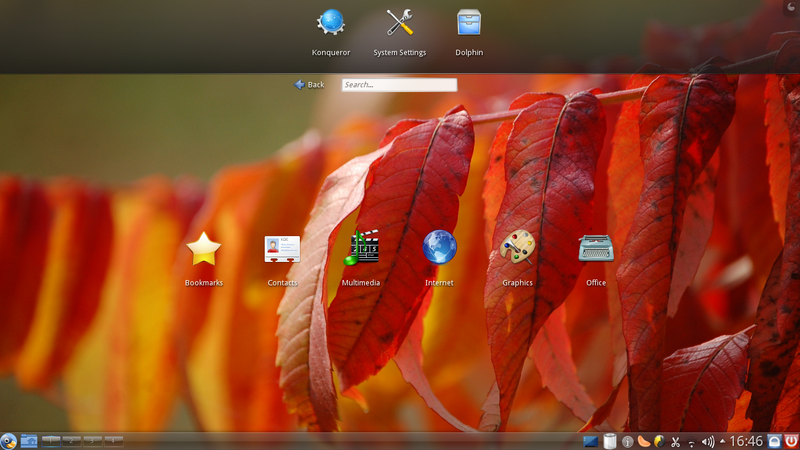 The desktop is somewhat controversially arranged with the panel at the top, presumably to achieve that touted unified look with the GNOME and XFCE desktops. 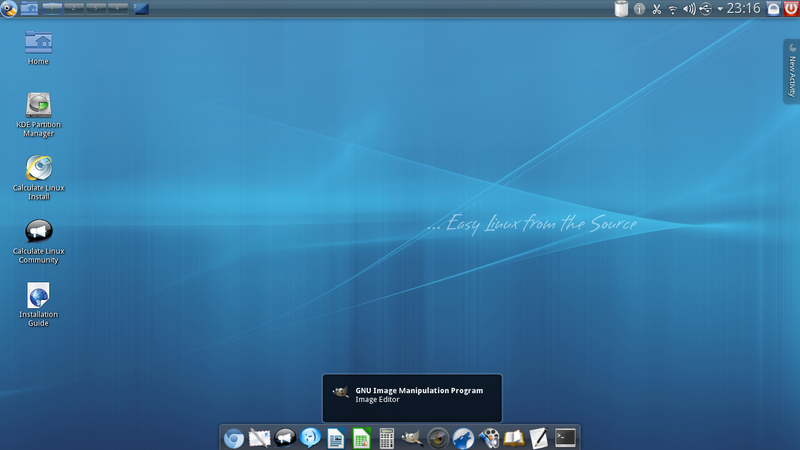 A shorter panel acting as a dock application launcher sits on the bottom, in similar fashion to Cairo-Dock, AWN or Wbar often employed in the other desktops and XFCE's own bottom panel. This is easily moved to one side and the main panel restored to the bottom, if you go for the traditional look. Several wallpapers are included, for the most part the usual KDE 4 collection but also CL styled backgrounds for this edition in more resolutions than you would think necessary, they obviously want their green background to look good in all sizes. The theming reminds of openSUSE this time around, and unfortunately the 'Penguins walking on the beach' background from the 11.x series is gone. The subdued green colors carry over from the Grub2 background to boot splash and splash screen which then gives way to a blue wallpaper that is equally understated for a more business-like look. All in all a beautiful desktop made for work and to visually please. 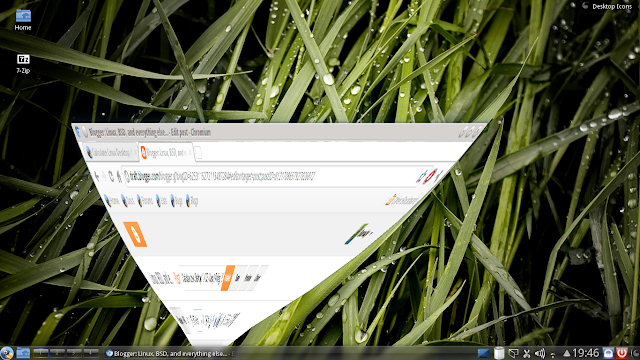 The default theme in KDE is Slim Glow. Included applications are rich and well balanced in my view and show that thought has gone into the selection.which covers most needs but hardly shows any overlap in functionality. Multimedia files and Flash worked straight away which means all the necessary codecs are already installed. KDE also recognized and set up my multimedia keys which allowed me to increase-decrease backlight and volume from the keyboard. I did not test desktop animations until after the install. There's an install guide right at the top in the docs section of the site, also linking to another page that explains how to customize the install image that is copied to your hard drive and a quick introduction to Gentoo layers. However, most people won't need this and simply customize later. If you start graphical installation from the shortcut on the desktop you will go through the usual routine steps, incl. setting up partitions and mount points, time zone etc. Crucially, it allows to install the boot loader (CL 12.0 is using Grub2) to any available partition and does not assume the MBR to be reserved for it like some others. This is making multi-booting with a chainloading setup a lot more convenient, in particular if you don't want Grub2 to take over your boot record yet. There's also a little video showing off the installation which was put up coinciding with the 12.0.2 point release. You choose and create users after the reboot, and a guest account is already specified to log in to. This is a full account from which you can also become root and is probably all you need to start with and get a feel for the operating system. Once booted I found that settings and look were the same as in the live session, minus a few icons. Unlike a previous version I tried my widescreen was fully recognized and the correct resolution 1366x768 used. Enabling desktop effects also worked without fail and I did not get one single error message like I do usually about this or that effect could not be enabled. Codecs and multimedia libraries are included, so you can get to work or rather entertainment straight away. Youtube and other Flash videos worked without fail and did not suddenly interrupt half way through or crash. Btw, I usually do not seem to have trouble with Flash on Linux, and resource usage is also manageable with around 30% peak on a 3X core. Not too bad, but many people seem to have huge issues with getting Flash to play their videos or cannot get audio to play at the same time. Like I said, not my experience. Maybe it's the distribution they are using? Included in the software collection is a large part of the usual raft of K-applications, but not exclusively and in my view the team behind CL have achieved an almost perfect mix. For example, Marble is likely to meet the needs of a wider audience as a Google Earth replacement for your Geography and travel planning needs, but the rest of the games and Kdeedu sections have been left out as they will likely appeal to less people who can still add it later. For graphics and the internet section you get mostly the well-known and functional KDE applications, like Choqok for following social media, the Kontact and Kmail suite, Konversation, Ktorrent etc., digiKam, Gwenview, Okular and Ksnapshot for photo management and images. Kdenlive and SMPlayer are here for your video editing and movie watching needs. On the note of editing, Gimp 2.8 is here as well. Chromium is the default browser although Konqueror is installed as well. You get the latest stable versions of the Chromium web browser and the full LibreOffice. An E-book reader is also installed, and all GTK applications like Chromium and the Gimp are fully integrated. Under System and Utilities you get the entire collection of goodies that come with KDE 4 and nothing else. Except the so-called Calculate Console that is, easy to confuse in looks and function with the System Settings ex-control center. Here you get a GUI to install to Flash drive, change network settings and generally retrace your installation steps, configure packages, administer user groups and more. Skype unsurprisingly still did not work. I set out to remove Amarok and emerged Clementine, added the Yakuake drop-down terminal and XBMC, a must have since Sabayon introduced it to me, and quickly ran out of ideas what else to emerge from the repositories as it all seemed covered. Eventually I tried to emerge --quiet-build virtualbox and this failed miserably when I had to kill the process at a load average of 5.07 and 95 C temperature. A few days later and after a huge base update I added PlayOnLinux which includes Wine. Emerging the tools went fine and I proceeded to install the Windows version of 7-Zip under the emulation layer. This turned out to run as intended, and, emboldened by success, I set out to try Fallout NV. Here's where we hit a snag as PlayOnLinux insisted to download the Steam client first which you then have to log in to, but then did not copy the files from the DVD. Guess it's back to Windows for the time being for this one. And so the time went by, between updating, browsing and writing this post. CL uses a mix of binary updates, which if figured correctly are coming from their own repositories and which represents the Calculate Desktop overlay, and emerging other packages from Gentoo using Portage. Appealing to everybody who favors the ports system in BSD and enjoys similar inspired implementations in Linux. And unlike the AUR or Slackbuilds.org, in Gentoo you get dependency resolution as well. If you like software compiling on your machine, or just need to keep warm in winter and rely on the generated heat blowing from the vents, CL or its daddy Gentoo are a good choice. On a laptop it might not be quite the right thing, especially when running from battery. Wireless quality was good, even up in the loft with the router down in the living room, not a mean feat, and where some barely connect at all at 28% signal strength Networkmanager in Calculate's KDE consistently showed two bars and never had trouble holding the connection. Using a distribution with good wireless connectivity is not something to underestimate in importance with a mobile workstation. The panel has features the places menu for quick access to the home folder, you also get the cute penguin that is CL's mascot for a menu button. To the right end of the panel the minimize to desktop and the Trash widgets are also present, with the Logout and Lock screen buttons to the far right, all thoughtfully added for a functional desktop experience. 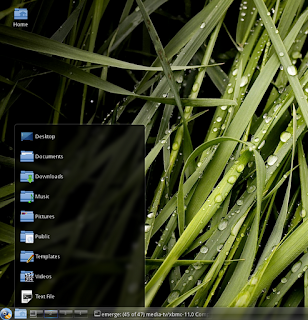 The Plasma desktop for netbooks is also present, and it worked really well on my 15.6' screen too. Thinking of using this as the main interface. The opportunities to get support and assistance or track down the information you need are quite extensive. 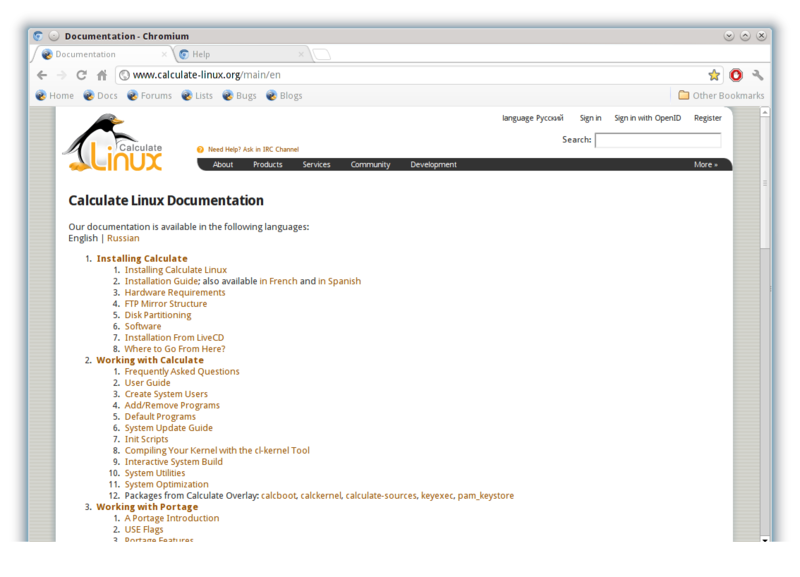 As already noted above there is a documentation section, there's also a package browser, a tutorial on USE flags, a page dedicated to listing the newest packages from the last three days, a mailing list and of course a forum (separated into Russian, English and French), another link to the Calculate forum at Linuxquestions.org and a Planet Calculate. The web site also integrate a bug tracker (report issues). Don't bother trying the IRC channel for help though, in the 24 hours I've been hanging out there not one conversation occurred between the handful of people logged on, with the only activity being the join and quit messages. In addition, the default Chromium browser comes with pre-set bookmarks pointing to relevant sections of the web site, most important to the documentation pages, the forum, mailing list, bug reporting and the blog that carries important announcements. If all that is not enough paid support is available which will appeal to the businesses and corporate IT environments CL is largely intended for. I've been running Calculate Linux 12 now for close to four weeks. One thing I noticed was that it consistently ran hotter than whatever else I had used previously. Temperature when idling was around 67 C, and this is at least 10 C more than with more light weight distributions. Just listening to rainymood.com open in the browser would immediately take it up to 78 C. Not sure if this is due to the heavier KDE desktop or a general problem. On the other hand CL has proved more stable and resilient than another well-known KDE-centric distribution featured here previously and survived several updates to its base without problem. CL also appears more focused, faster and more stable than its cousin of sorts, Sabayon Linux, which I have tested and written about quite extensively. The no-nonsense, business-like approach serves CL well in this regard. I would highly recommend CL to anyone seeking an easy entry point to installing and running Gentoo, and to anyone looking for a rolling distribution. Nice one. The 12.0.2 maintenance release has since come out that fixes several bugs and slightly reduced the size of the ISO. Hi, thanks for the review. I use Arch most of the time and just wanted to mention that the AUR does resolve dependencies. The pkgbuilds take care of this and then create an Arch installable package, which can then removed with the regular package manager, pacman. I forgot to say that, of course, the package can also be installed with pacman. One can also use several different AUR "helpers" that will download the pkgbuild, build the package and then install it. Hi Jonathan, thanks for commenting. You are correct about Pacman and the AUR, but what's all that got to do with Calculate Linux which is using Gentoo? I mention it because in your review you compare Gentoo to Arch and claim the the AUR does not resolve dependencies, which is false. "And unlike the AUR or Slackbuilds.org, in Gentoo you get dependency resolution as well." Hmm, in my experience building a package from AUR does not automatically pull in its dependencies when compiling. I guess it depends on what you think of as dependency resolution. It provides a list of what is needed, just like SlackBuilds do. And on what/if any helpers you are using because in Arch you shape it your own way. OK, I see your point. If I download the tarball then run "makepkg -s" it pulls in the dependencies. Likewise, when using yaourt, for example, the same thing happens. Perhaps the confusion comes in the definition of "dependencies"? In any case, I had no wish to cause a problem, I just wanted to clear up a minor point. I appreciate your taking the time to review another Linux distribution. I've used many of them out there, and have settled on Arch for now. I've got Sabayon installed as well, but have yet to really tackle Gentoo as building from source is not my idea of fun! Hi Jonathan, didn't know that about "makepkg -s", thanks for the tip, it will come in handy next time I install Arch. You learn something new every day. I know of yaourt and packer but have so far preferred to use only very few packages from AUR and stick to the main repos. I was wondering though, if you ever tracked down the issues with VirtualBox (Prolly should run it on an x86_64 anyway, and always make sure you've enabled the virtualization in your BIOS, BTW), and especially Skype - although I'm much more inclined to use Jitsi w/Kamailio instead of Skype. An out of the box working Skype is kind of important for a good many deployments. One other thing, where dependency resolution is concerned on Slackware ;) using sbopkg w/queuefiles provides for a mostly seamless installation process where most software is concerned. i.e., : "# sbopkg -i .sqf -k"
Yes, it is indeed a very layered approach, but that figures into the UNIX philosophy nicely. Anyway, great review of a distro that I like too, and that's prolly high praise coming from a slacker who likes all of his compilers and libraries right there at his fingertips after every fresh install. Nice review. I am currently using Calculate Linux 13.11 for last few days and thinking of reviewing it in my blog. Your article gave me a lot of insights. Thanks for the same. One thing I was wondering about Calculate is that it is built on Gentoo which is supposed to be lighter than Ubuntu/Debian/Fedora based distros. However, what I saw is a slightly heavier distro in terms of resource consumption. Even your review mentions the same. It is a bit surprising to me. Hi Arindam, glad you found my review relevant and useful. 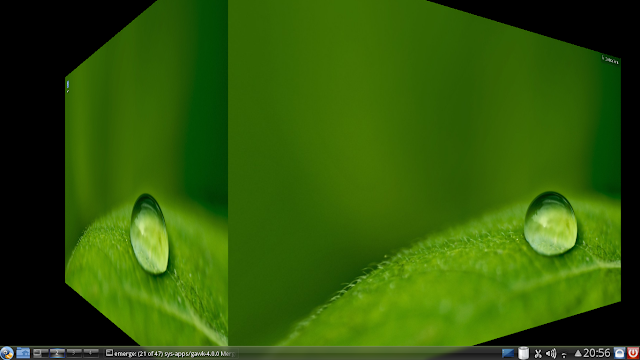 Debian is definitely the best choice among the ones you mentioned if you want 'light'. But it would be interesting to read your take, Who knows, Calculate Linux may have improved on its resource usage pattern.